Also known as Mr. Sophisticate or Daddy Sophisticate to those who have been requesting it! It’s been a long time coming (like, 2 and a half years), but I’ve finally been able to write, knit, have test knitted, have tech edited, take pictures of and create the patten layout for the adult version of my baby pattern, Baby Sophisticate. I’m not sure if people are still waiting for it after all this time, but I hope some of you are still excited to see this pattern hit the market! I’ve designed this pattern so that it can be made for a man or a woman, with optional waist shaping for the women’s pattern and different lengths for certain parts of the sweater depending on whether it’s being knit for a guy or a girl. 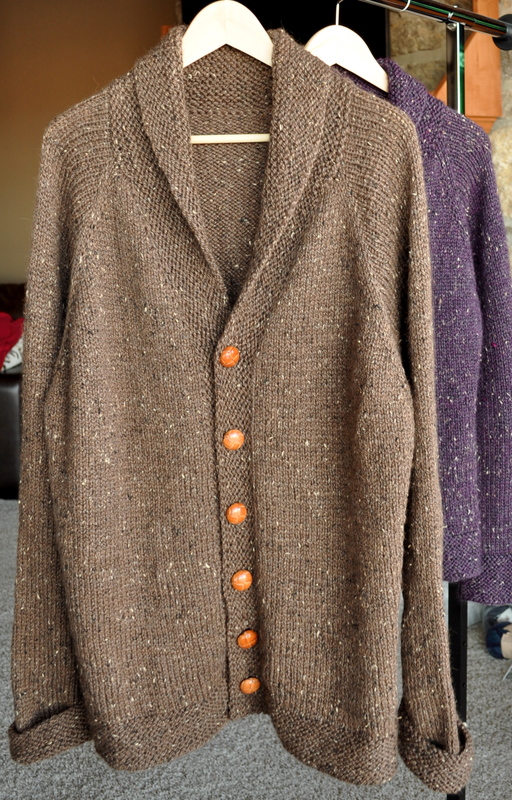 The pattern includes sizing for chest measurements of 30, 34, 38, 42, 46, 50, 54, 58, and 62 inches and calls for Knit Picks City Tweed Heavy Weight (mine in Brocade and the men’s sweater in Tabby). You will need 5, 6, 7, 8, 8, 9, 10, 11 and 11 skeins for the above sizes. 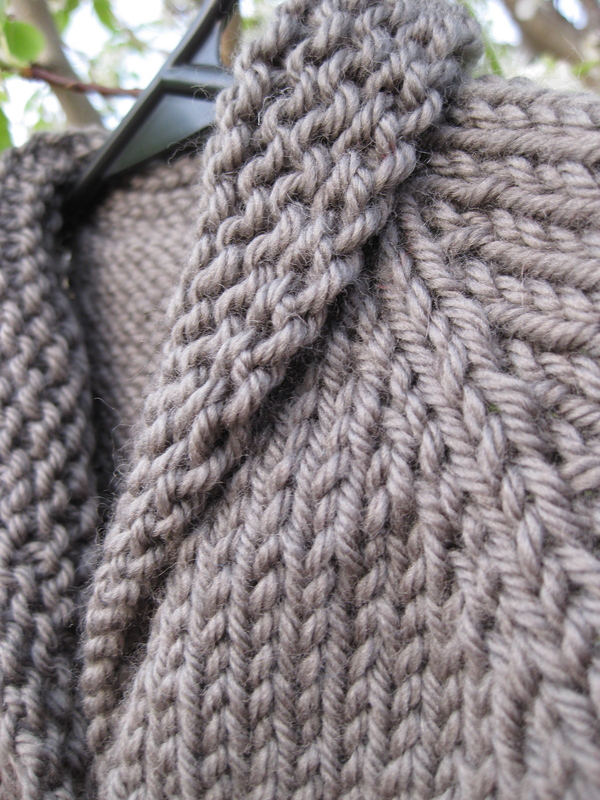 The gauge for the sweater is 15 sts/20 rows to 4 inches in Stockinette on size 8 US needles. 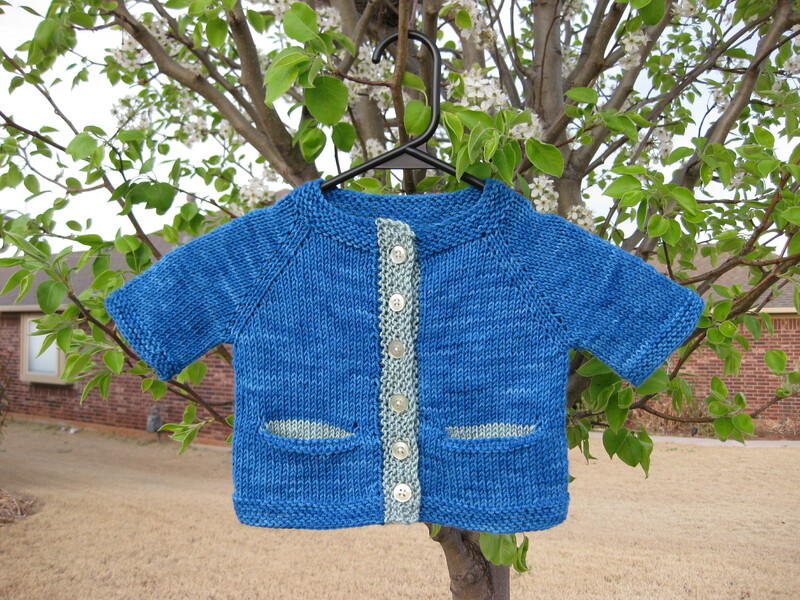 Just like Baby Sophisticate, the sweater is knit from the top down, with a raglan yoke, and the button band and collar are picked up and knit after the body is finished. 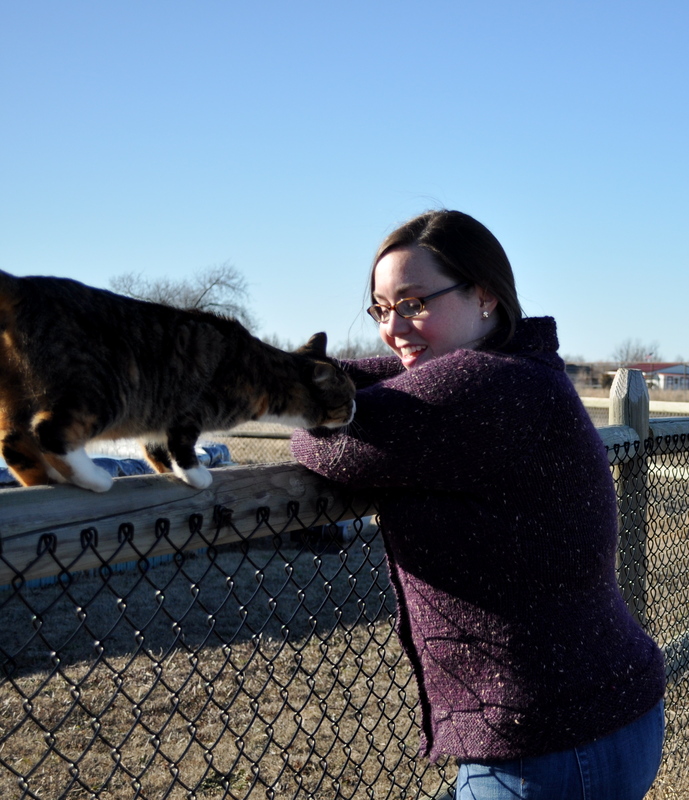 That’s Sophie helping me out with my photo shoot. The pattern is available for 6.50 (USD) as a download in my Ravelry Store or through Paypal. Just click below! 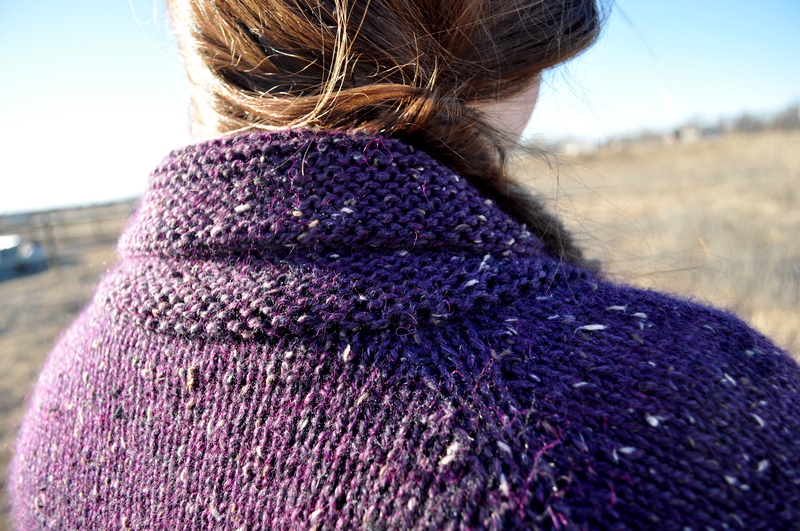 If you do decide to knit Sophisticate, I always welcome feedback and questions, so please let me know how you like it! Of course I’m kidding – your baby doesn’t have to be an Upper East-Sider to look adorable in this sweater! Using Mission Falls 1824 Wool and with a gauge of 15 sts/ 4″, Baby Sophisticate is an extremely quick knit (perfect for last minute baby shower invitations). 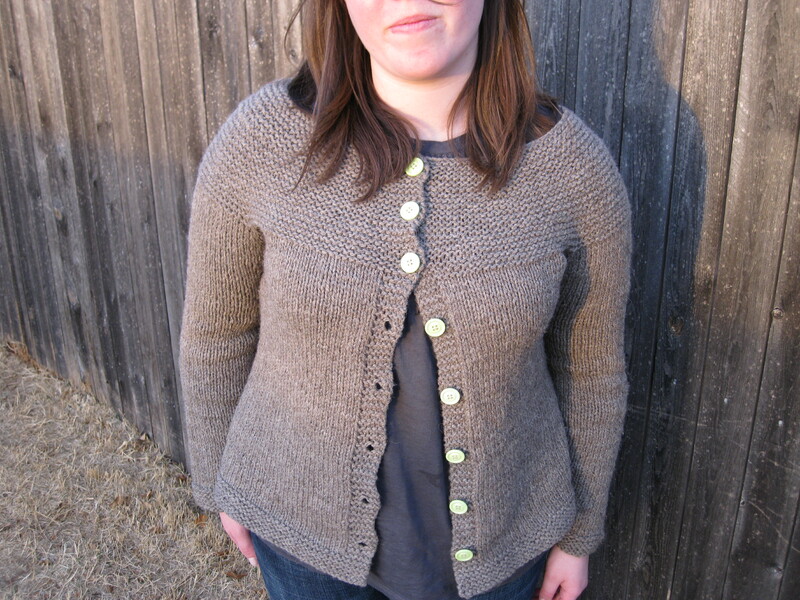 The design is a top down cardigan, with a picked up all-in-one button band and collar. 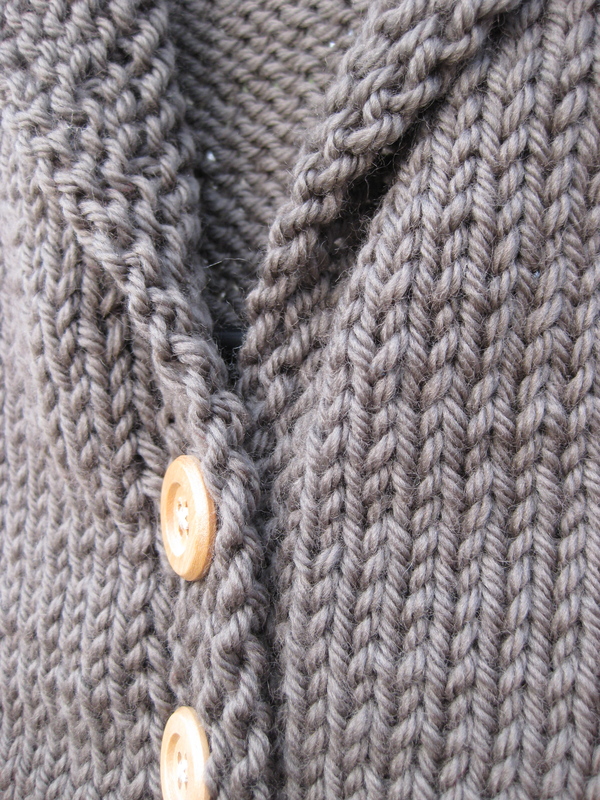 This means no seaming – minimal finishing is the only way to go! I want to give a HUGE thank you to Emmadoodle (aka Emily) for test knitting this design! 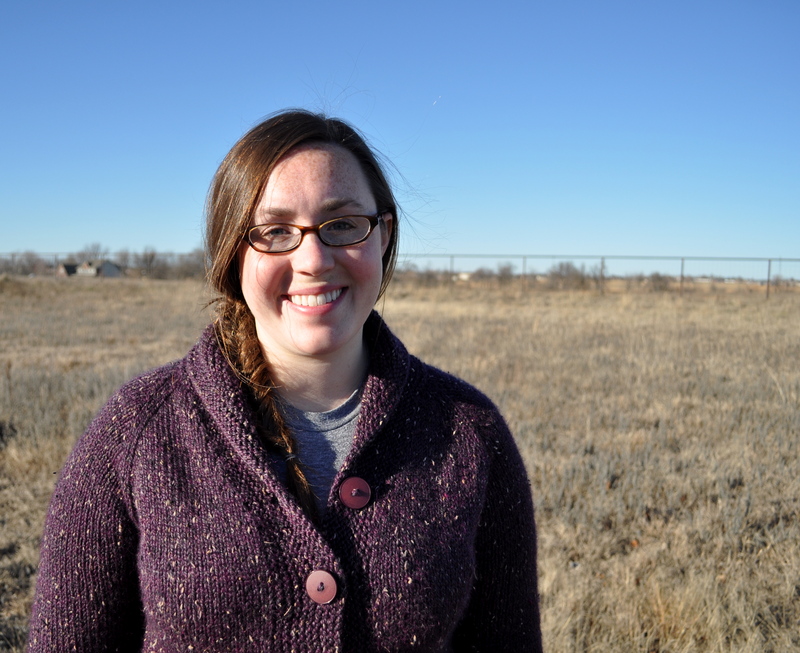 She did a wonderful job of helping me find mistakes and just making things all around more clear! We hope that all the bugs got worked out in this process! One round of Kristen and Emily making adorable baby sweaters for friends, and I just had to join in. This first pattern [in a series of two :-)] I like to call Bunting. This name arises from my lack of finesse for pattern naming, but mostly from the fact that I love that the colorway of the yarn is Indigo Bunting. 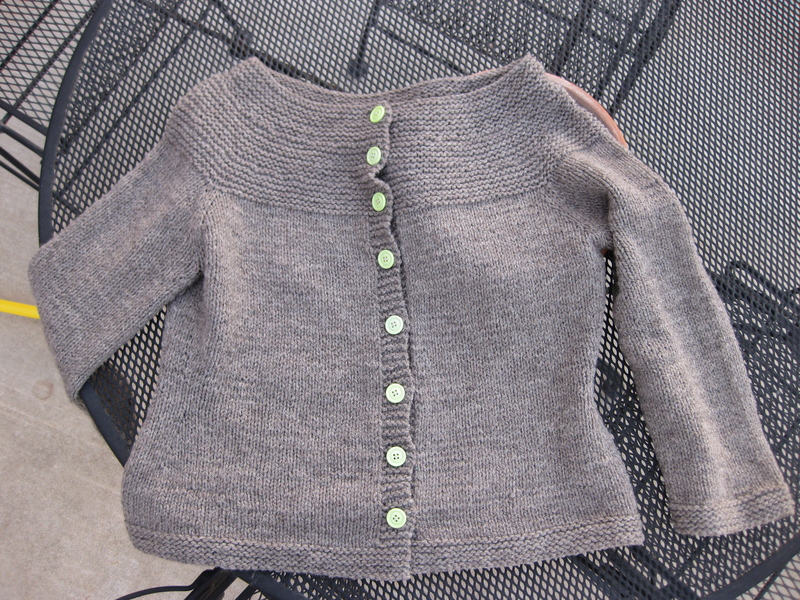 The prototype has been sent to Baby Cole, and I’m told he looks adorable in it! 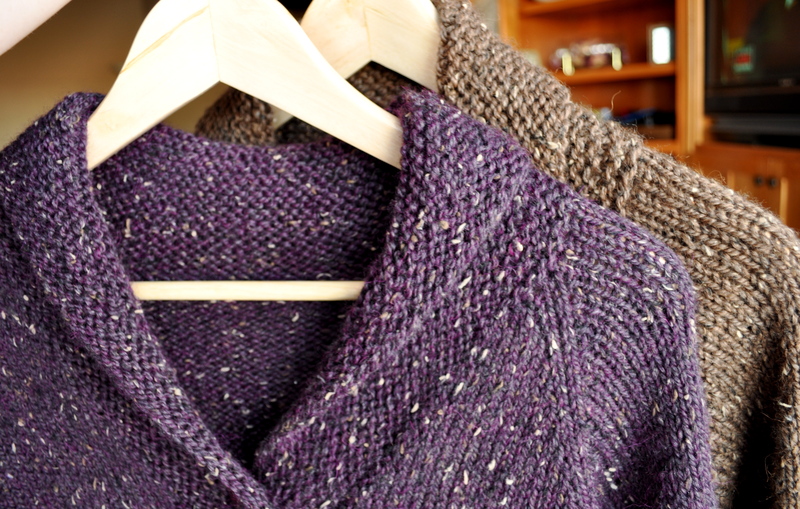 This is a really simple sweater, knitted from the top down with contrasting color button bands and pockets. I love pockets on everything, so they are my favorite part of the pattern! 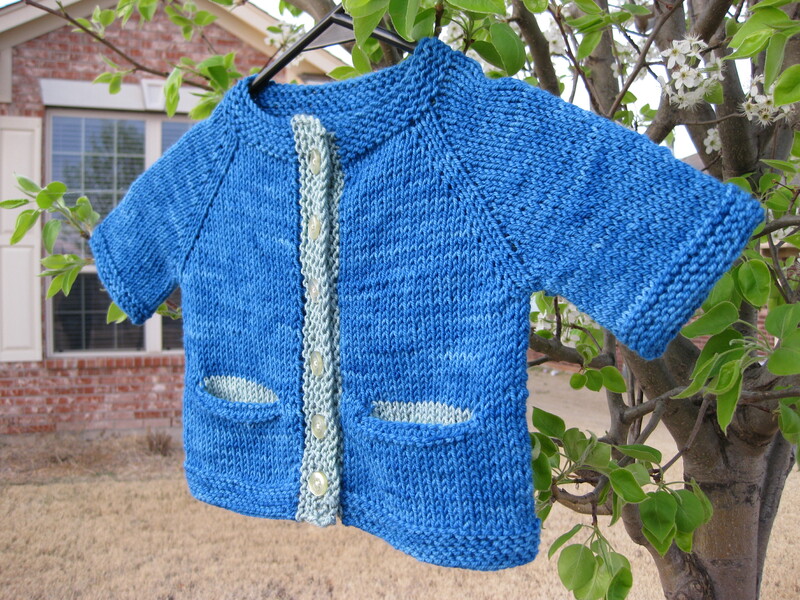 The pockets are very easily done by knitting waste yarn while working the body and then picking up live stitches around the pocket and knitting a little pouch. 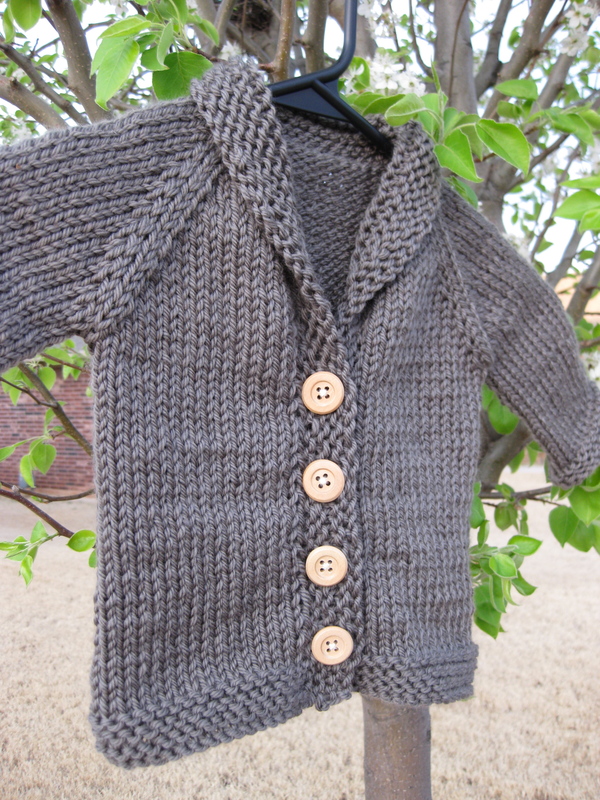 I don’t expect many babies to actually use the pockets on this sweater, but they will look good while not using them! The yarn is Miss Babs Yummy Sock and Sport Weight (which I seem to be using a lot lately). The main color is Indigo Bunting and the contrasting color is Coventry Green. I was able to get some lovely light green buttons from Tinker’s Button Shop on Etsy that I think look great against the Coventry Green. 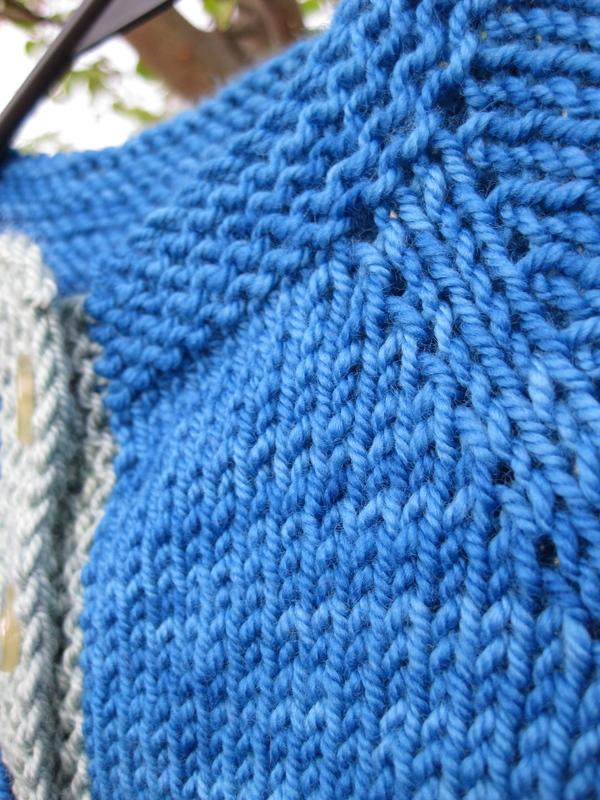 Gauge for this pattern is 18 sts/ 24 rows to 4″ in Stockinette stitch on US 5 needles. This is a pretty simple pattern, however it has not been test knit by other knitters. It has only been knitted by me, and since I made it up everything made sense to me. So if you find a mistake (or just something that could be made clearer), please let me know. I’m pretty quick to respond, so don’t be shy! Next up: Baby Sophisticate . . .
UPDATE (04/06/09): I’ve updated the pattern pdf to include more complete instructions for the increases for the yoke as well as correct a mistake for the smaller size that was brought to my attention. The file is much smaller as well! Yay! This is my new favorite item of clothing! I’ve been wanting to try out the top-down approach for a while, and I couldn’t resist the garter-full yoke of this sweater. 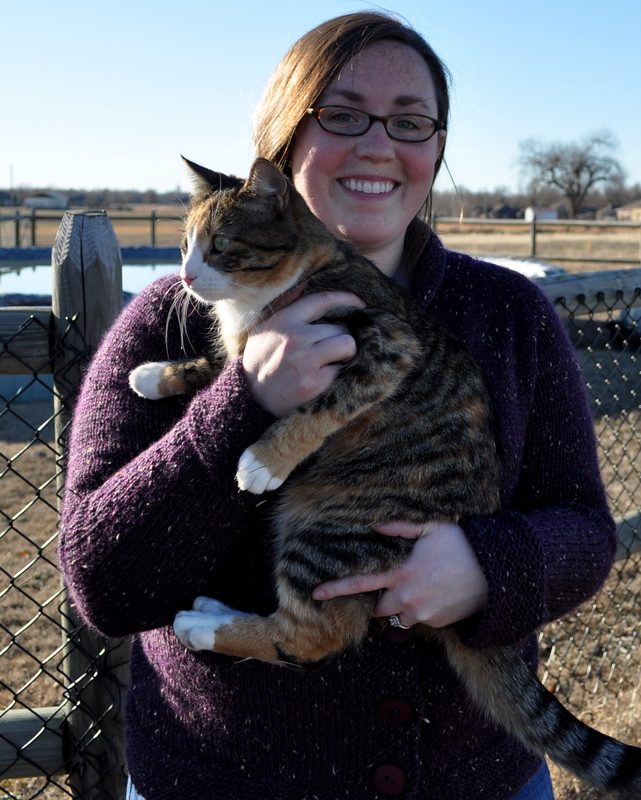 The yarn I decided to use was left-over from the Wedding Blanket for Kristin and Derek – Plymouth Homestead. I used about 4.5 skeins (~860 yds). I wasn’t anywhere close to the called for gauge, so (after a bit of math) I decided to make the smallest size, knowing that it should come out to be my size in this yarn. The only modifications I made: one less raglan increase, and decreasing on the sleeves to make them more fitted at the wrist. This was such a fun knit! 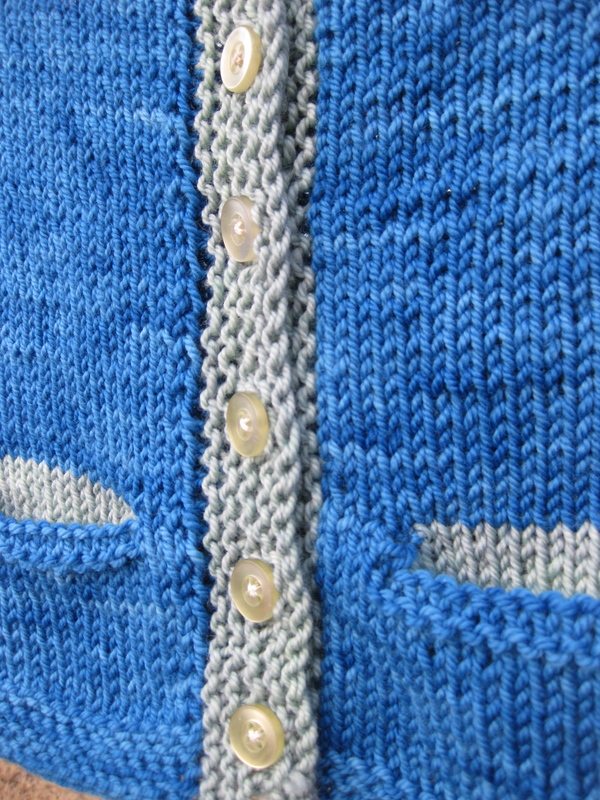 I love the neutral color of the yarn, but I wanted to add some interest with bright buttons. After shopping (a lot) on Etsy for the perfect buttons, I’ve settled on some very cute plastic apple green buttons from BigFish. She (BigFish) was very helpful – I initially ordered a grab bag of green buttons, needed 6 more of the ones I loved, and BigFish got them to me. I’m so excited to have exactly the buttons I wanted for this! I highly recommend you try this top-down pattern. The design and the technique are so much fun! It has inspired me to try out a few top-down pattern designs. So far I’m really liking what I’ve been able to do with top-down knitting, and can’t wait to share what I’ve come up with!